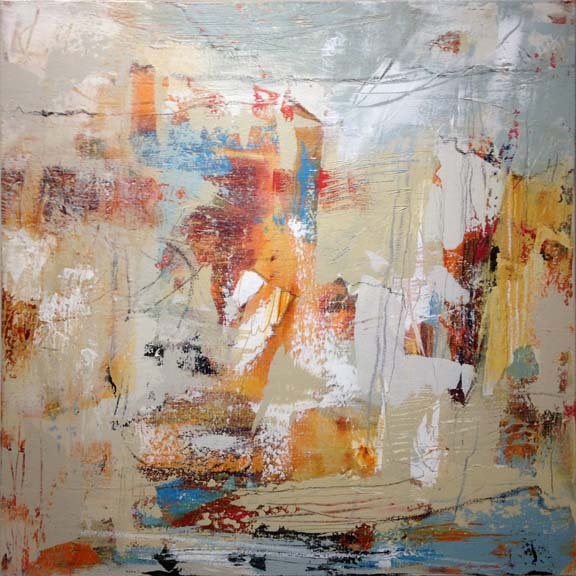 A new abstract painting has been delivered to Ruhlen – Owen Contemporary on Canyon Road in Santa Fe, New Mexico. 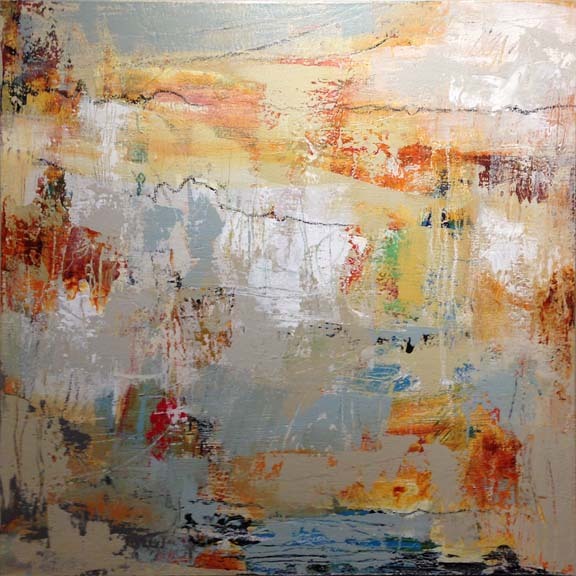 Recently delivered to Ruhlen – Owen Contemporary on Canyon Road in Santa FE, NM is this second version of The Butterfly Effect by Martha Rea Baker. 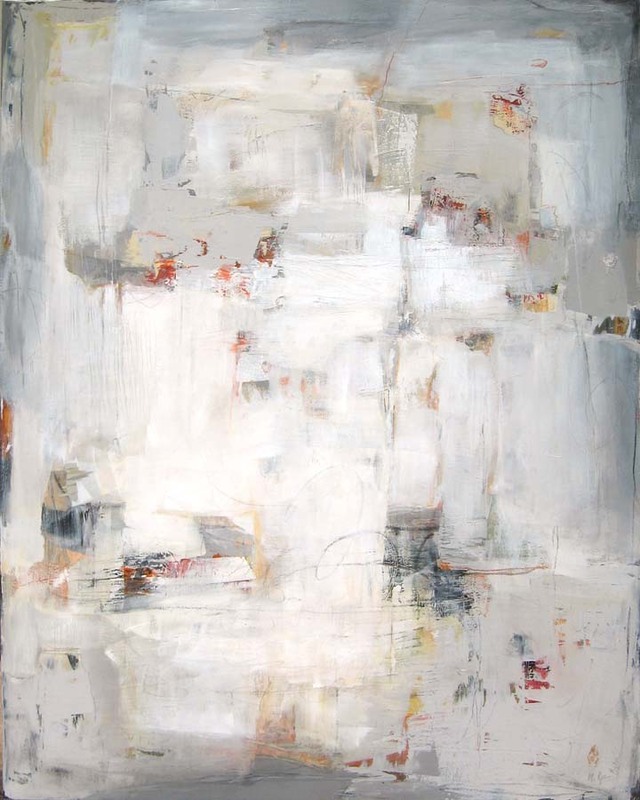 Martha Rea Baker has been busy in the studio working on requested large acrylics for Allison Brown Simmons in Jackson, MS. With an eye on the collector, the gallery staff continues to request light neutrals in cream, white and grey, accented with a hint of color. Spring, a time of renewal and regeneration, is the perfect inspiration for this palette. 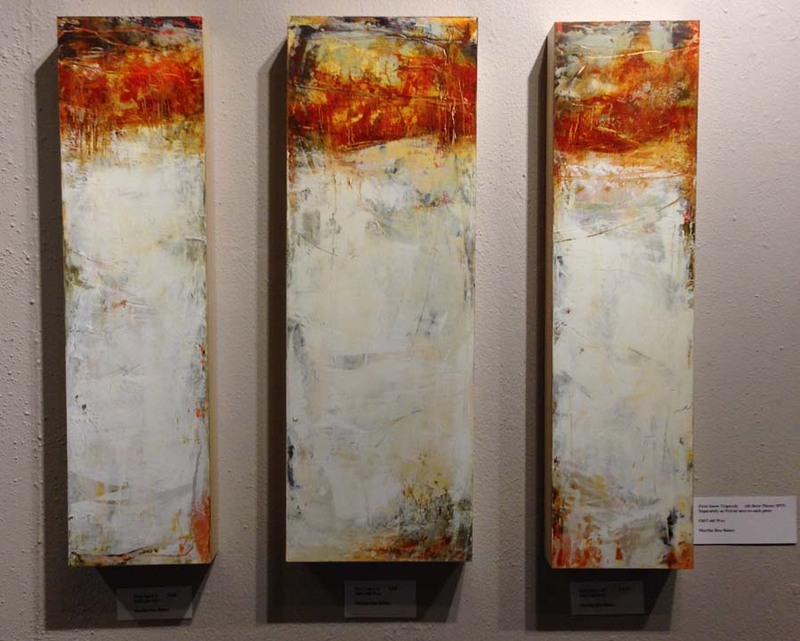 Martha Rea Baker recently delivered a triptych painted during the Hill Country Arts Foundation 2016 annual retreat to Ruhlen-Owen Contemporary, formerly the Karan Ruhlen Gallery. The Hill Country Arts Foundation presented an exhibit of the seventeen AWOL – Artists Without Limits – painters in the beautiful Duncan-McAshan Gallery with a well-attended opening reception on January 9.Following the retreat this year Martha spent an extra week in Dallas, TX viewing the Jackson Pollock exhibit at the Dallas Museum of Art, visiting friends, collectors and various galleries and attending an art exchange party with several acclaimed Dallas artists. The first three weeks of January have provided much inspiration for an exciting 2016. Jackson Pollock: Blind Spots is the largest survey of the artist’s black paintings ever assembled. It offers critical new scholarship on this understudied yet pivotal period in the artist’s career and provides radical new insights into Pollock’s practice. With more than 70 works, including paintings, sculptures, drawings, and prints, the exhibition first introduces audiences to Pollock’s work via a selection of his classic drip paintings made between 1947 and 1950. These works serve to contextualize the radical departure represented by the black paintings, a series of black enamel paintings that Pollock created between 1951 and 1953. An unprecedented 31 black paintings are included in the DMA presentation. Exhibition works from the height of the artist’s celebrity set against his lesser known paintings offers the opportunity to appreciate Pollock’s broader ambitions as an artist, and to better understand the importance of the “blind spots” in his practice. 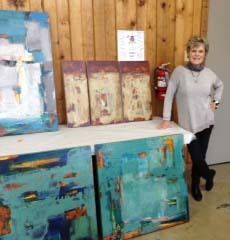 Two new acrylic paintings have recently been shipped to Brown’s Fine Art in Jackson, MS, Martha Rea Baker’s long time gallery. 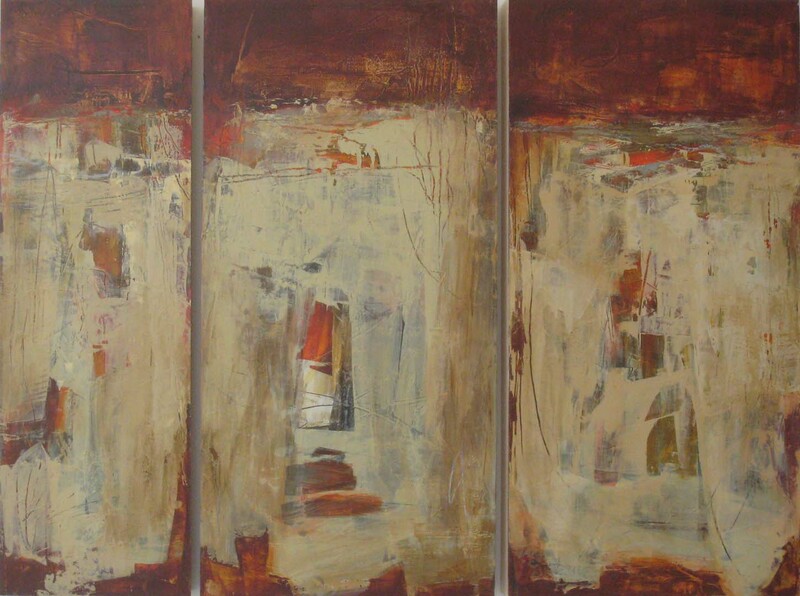 Perhaps the colors of Autumn inspired these two new paintings. 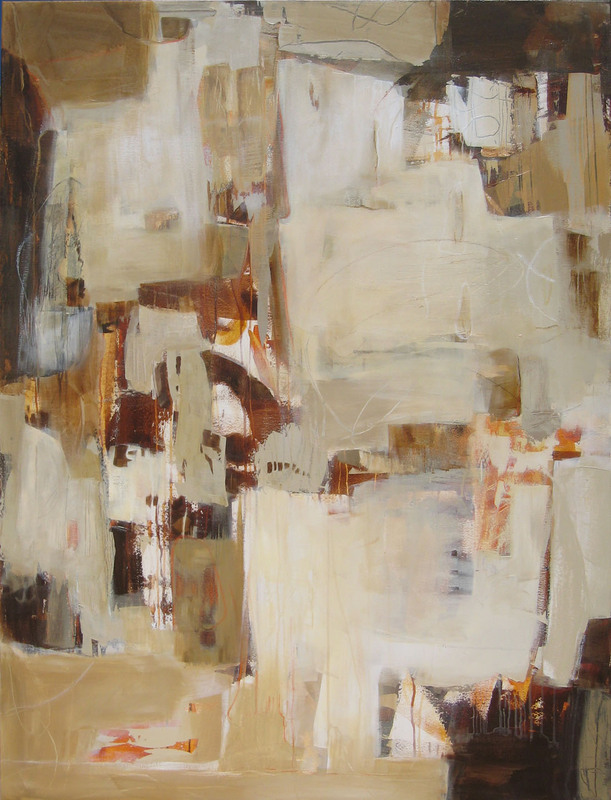 Two new acrylic abstract paintings were recently shipped to Martha’s longtime gallery, Brown’s Fine Art in Jackson, MS. 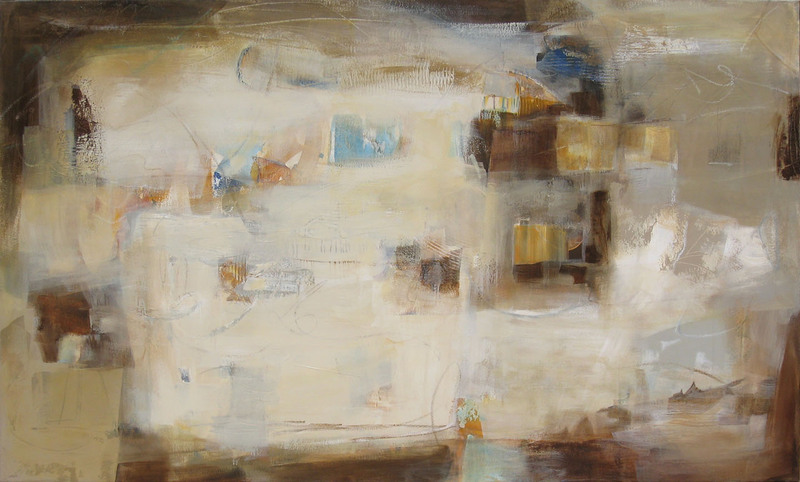 The theme of Time has been an ongoing concept inviting exploration by Martha Rea Baker for over two decades. Dordogne was inspired by Martha’s travels in the southwestern section of France last year. A village at the base of white limestone cliffs, river reflections below and chateaux perched on top are abstractly rendered. Once again, the first post of the new year is a report on Martha Rea Baker’s annual painting retreat in the beautiful Texas Hill Country. 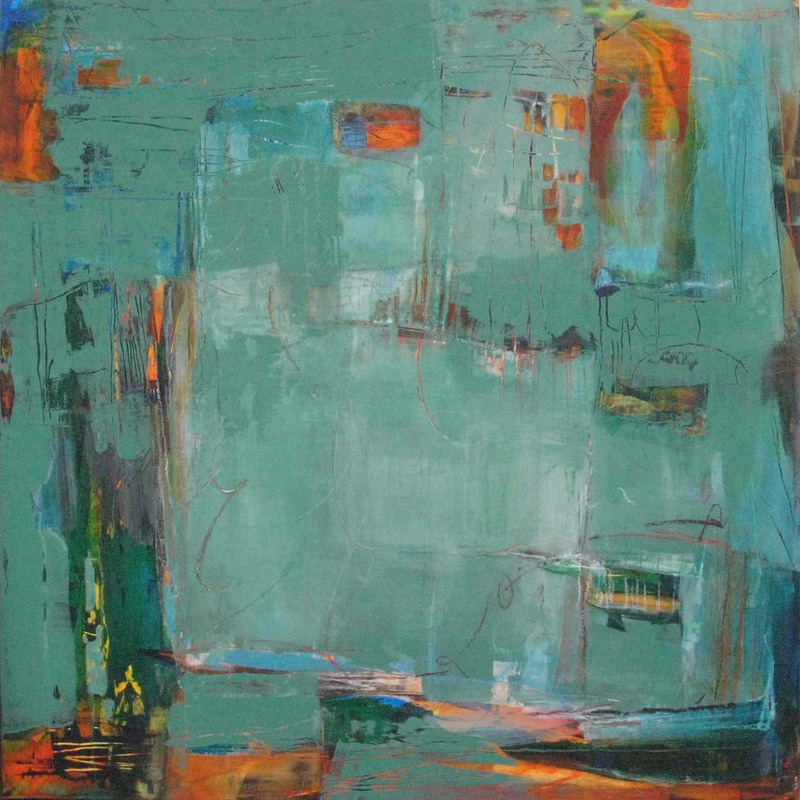 The Hill Country Arts Foundation in the small town of Ingram, TX is host to a group of 17 artists who each January travel from Texas, New Mexico and Tennessee to begin the new year creatively with talented artists who also happen to be dear friends. This is Martha’s tenth year of attending and next year will mark the twenty-fifth year of group which began as a wintermester art course at Collin County Community College in Plano, TX. The current group has adopted the name AWOL—-Artist Without Limits—- which describes the philosophy of these artists. 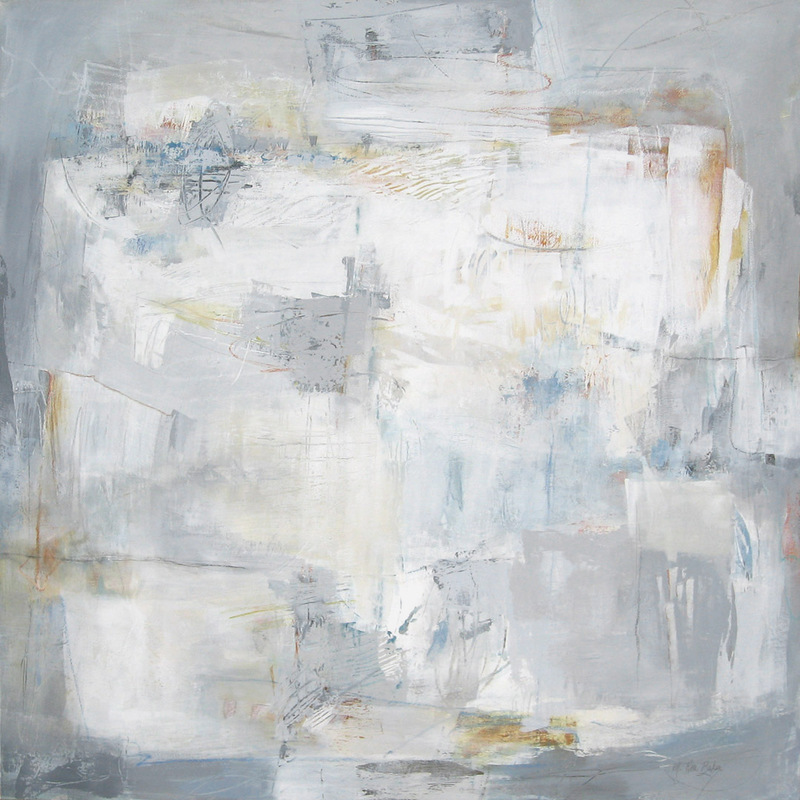 This year Martha spent the first three days of the retreat completing two 24″ x 24″ acrylic paintings on canvas to be included in the 2015 exhibition in the Duncan-McAshan Art Gallery at the Foundation. 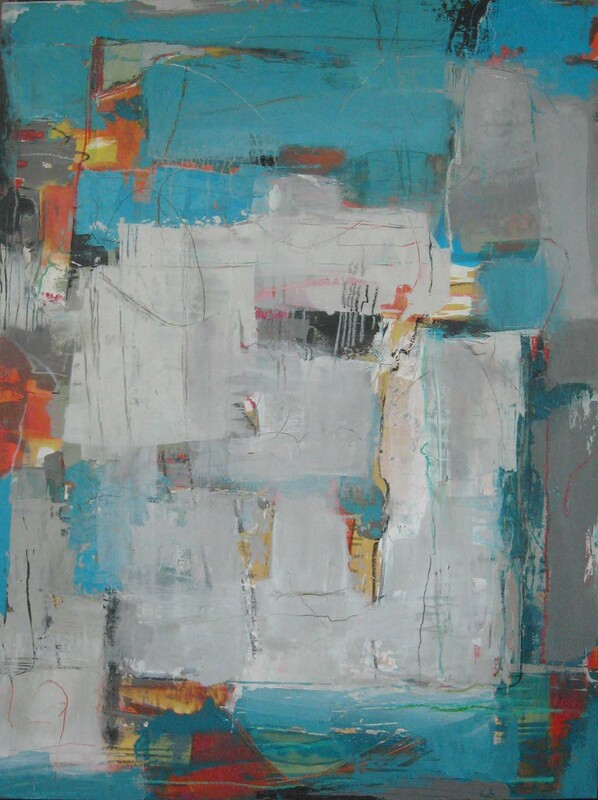 Additional work entered in the exhibit, AWOL 2015 included oil/cold wax paintings on panel. This exhibit will hang from January 10-30, 2015. During the final week of studio time Martha worked in acrylic on gessoed wood panels. A selection of the paintings are posted below. These pieces are very close to being finished. 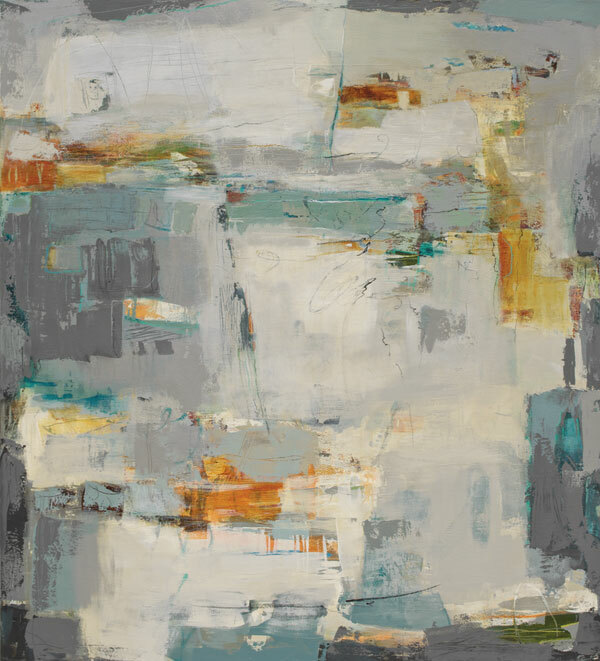 An article in the November issue of California Homes magazine, “Adding Color to a Black Dress and Pearls” includes one of Martha Rea Baker’s acrylic abstract paintings. 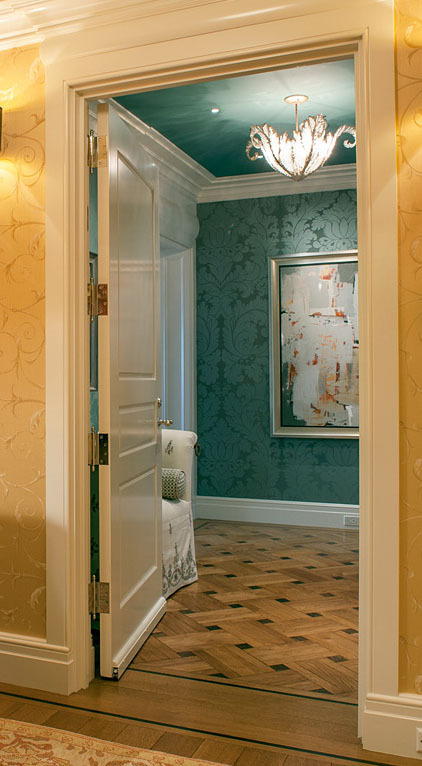 Marking History III is installed in the emerald entry of a Nob Hill condo in San Francisco. Located in a mid-century modern high-rise across from Huntington Park, the residence features sweeping bay views bracketed by the Golden Gate and Bay Bridges. 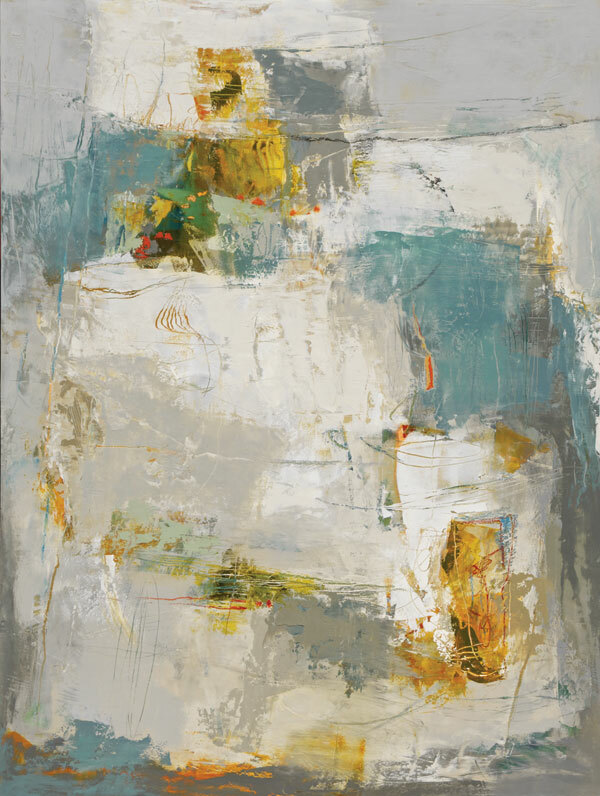 Martha Rea Baker has recently delivered two new paintings for the upcoming exhibition “In the Abstract” opening at Karan Ruhlen Gallery in Santa Fe, NM on May 23.